“There’s a mistake. Moonlight, you guys won best picture. This is not a joke”. It was hard, almost painful, to watch. Even if you paused to consider that people have suffered worse indignities, you had to feel bad for them. Coming into the Oscars, La La Land was riding high on box office success and critical acclaim, picking up several Golden Globes and BAFTAs along the way. Earlier in the night, it had taken five awards, including the coveted Best Director and Best Actress. So it was never going to be a case of going home empty handed or feeling totally unappreciated. 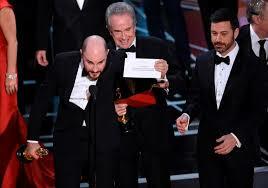 However, more than anything, what happened on stage on Sunday night was just embarrassing: to the presenters, Warren Beatty and Faye Dunaway, to the producers of La La Land (who were mid-acceptance speech) and Moonlight, and, let’s not forget, to PwC. What should have been a routine night of worldwide, and glamorous, free publicity for PwC ended in ignominy. Moreover, the task at hand was comparatively simple for a team of accountants which regularly handles some of the world’s most complex financial audits. Count the votes, write down the winners, and give out the cards. We’re not quite sure why duplicate cards are required, though perhaps PwC’s army of actuaries should have pointed that out, given both Brian Cullinan and Martha Ruiz had memorized the results, the two-card system was unnecessary and more likely to fail than it was to save the day. Now what? The swift and grovelling apology issued from PwC followed textbook crisis-management protocol. When you are so obviously at fault, you can’t pass the buck or wait for the air to clear. So, Cullinan and PwC did the only thing they could do: fess up, and take charge. In Public Relations terms, this is known as ‘owning the story’. What’s been interesting to see is that, while explanations have been made (was it the colour of the new envelopes?) there’s been a top down acceptance of responsibility from this Big Four firm. And this is as it should be. It is, at the very least, good leadership. We’ve made the point a few times in our blogs that smart leaders are always thinking long term, focussing less on, say, day-to-day trading price and more on what the trend looks like over months or years. No one wants to be in the news for the wrong reasons, but these things move through their cycles quickly. We think PwC has managed it well and has shown some real courage by not trying to downplay it, which would have been easy to do. But the truth is, it was a human error, and they happen. Accounting firms have made much, much worse mistakes in the past. Whether or not the Academy fires them will be up to the individual personalities involved and whether they’re inclined to be hanging judges or not. Our instinct would be to show a little loyalty, and let everyone get on with their lives.